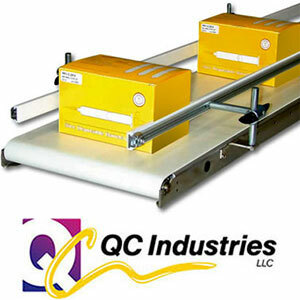 When you need a reliable conveyor for critical automation processes, low profile conveyors from QC Industries fit the bill. They are often less than 2" total height, so they're ideal for tight spaces and specialized needs. There are several conveyor styles with endless customization options to suit many different product loads and environments. They are frequently used in medical and pharmaceutical applications, parts assembly, food handling, general warehousing, and more. Thoughtful design reduces the time you'll need to spend on cleaning, belt changes, and tracking adjustments. Backed by a 10-year warranty. Automation Series Conveyors are easy to configure, utilize, and maintain. Built with rigid aluminum frames, sealed ball bearings, and capable of speeds up to 400 FPM, these user-friendly conveyors are ideal for machine integration applications. Industrial Series Conveyors with steel frames and low profiles provide efficient product transport in demanding environments. With options such as plastic chain belting, motorized rollers, precision indexing, and capacities up to 600 lbs., there is a conveyor for almost any industrial application. Choose low profile HydroClean conveyors for sanitary and wet environments. They feature stainless steel frames and tool-free disassembly, so they are easy to clean and maintain for food handling, cleanroom, and pharmaceutical applications. This video showcases the packaging line at a medical supply company, which integrates several different low profile conveyor models for moving, positioning, elevating, and storing product.